"There are only two emotions on a plane: boredom and terror." -- Orson Welles, interview to celebrate his 70th birthday, The Times of London, 6 May 1985. For some people, flying represents their worst fears. Not only are you helpless if something goes awry, but you will most likely have some time to ponder it before the end arrives. During the main leg of the flight, Orson Welles was correct about boredom - before all of the entertainment options sprung up on airplanes. In his time, imagine flying across country in a smoke-filled airplane with nothing to do except immerse yourself in a book. These days most passengers play games, watch movies or listen to music to keep themselves occupied. Of course, there is always the option of actually talking to your neighbor. Inevitably, the plane must land and the fear factor usually rises again. Crosswinds, runway conditions and pilot skill all play a role in landing. Looking out the window and seeing the wing rise and fall as the airplane rotates to counter various atmospheric effects can certainly make one nervous. Depending on the above factors, sometimes you are greeted with a jolting sensation as the plane touches (sometimes bounces) down. The number of accidents is decreasing as a trend. Since 1982, this number has basically been cut in half. The percentage of planes being destroyed from an accident has fallen dramatically. It is refreshing to see that aviation safety is looking up. One reason might be from advancements such as the Traffic Collision Avoidance System, which is designed to reduce mid-air collisions. As the TCAS and other systems evolve, accidents should continue to trend downward in the years to come. Other reasons might include the composition of the planes themselves, procedural changes, better pilot training methods or perhaps aircraft design. Come back and visit this site again for further exploration of this topic. If the news reported the number of safe flights on a daily basis, the papers would be overflowing with that one theme. Unfortunately, that aspect isn't news; what is news is when an airplane crashes. When that happens, we have no reference point to remind ourselves that we have a 1 in 2 million chance of being involved in an aviation accident and have at least a 60% chance of surviving it. If one were to think that news is reality, then nobody would fly. News generally only represents something way out of the ordinary - a statistical outlier. While nothing is guaranteed in this world, flying is still a pretty safe bet. 1) What advancements have been made in aircraft technology? 2) What other flight management systems are being considered to improve flight safety? 3) Will newspapers ever put stories in context? Definitely need to include annual number of flights in a future article so we can better see the trend. Interesting data. It might be more telling to place this in the context of annual number of flights. 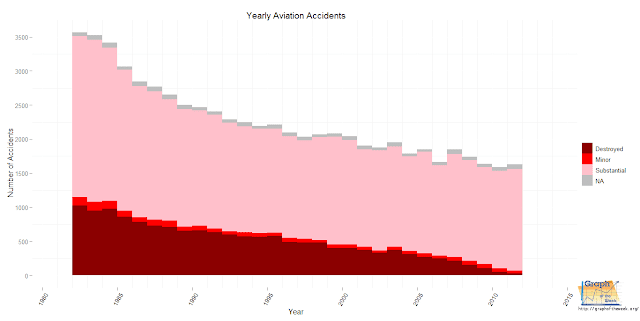 Is it possible that the ratio hasn't changed much (# of accidents/# of flights)? In which case this trend would be more indicative of fewer flights than it would be of improved safety. Overall, a neat chart. Thanks. Agreed re: context. I'll try to put something together in the future for that.